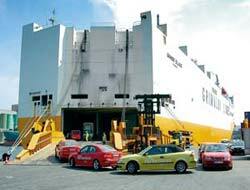 For Saab’s 60th birthday, Egekont provided dependable transportation on Ro-Ro vessels for the vehicles on Saab’s Performance Team, enabling the team to travel from Wallhamn, Sweden to Izmir to meet up with Saab fans in Turkey. Arkas provided sponsorship with transport services in an exhibition held at Hezarfen Airport in Istanbul on May 5th, 2007, in which the Saab Performance Team displayed their 20 years of acrobatic experience. Attendees interested in taking a test drive had the chance to try out Saab’s new line of cars. Saab rally drivers have joined together to form the Saab Performance Team, which uses a standard 9-3 sedan that can be bought from any dealer. The team displayed performances of incredible 360-degree turns at speed, driving on two wheels and a stunt in which the automobiles drove toward each other at top speed, changing directions just before they were about to crash and stopping bumper to bumper. Over one thousand spectators watched the synchronized driving exhibition.